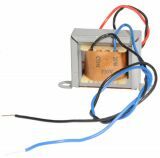 Audio Тransformer 5 W, 100 V, 8 Ohm 4 pin Audio Transformer 5 W, 100 V, 8 Ohm. Audio Transformer 3 W, 100 V, 8 Ohm 4 pin Audio Transformer 3 W, 100 V, 8 Ohm. List Price: 4.20лв. VAT Incl. 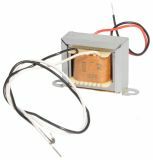 Audio transformers are designed to be used mainly in audio systems. They can be used to stop high-frequency interference, to combine or separate audio signals, or to link chains of different impedance and resistance. These transformers were originally designed to connect different telephone systems with one another while keeping their respective power supplies isolated, and are still often used to connect professional audio systems or system components. As magnetic devices audio transformers are susceptible to external magnetic fields such as those generated by conductors, with flowing alternating current. Audio transformers using very weak signals, such as microphone signals, often are magnetically shielded to prevent unwanted influences of magnetic nature of the electrical network.